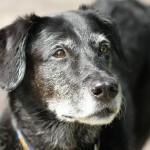 You may have heard people describe a dog, past or present, as their Heart Dog. You may have had one yourself. 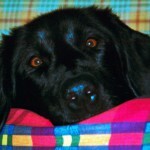 It’s a term used to describe that ONE special dog in someone’s life, a canine soul-mate so to speak. Kali was very much my Heart Dog. But was it something pre-ordained or was it a product of the way we grew and worked together? I think it was both. 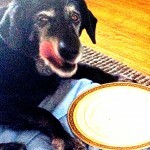 Fifteen years ago I was looking for a dog, specifically a rescue. I drove from shelter to shelter, tears streaming down my face from the overwhelming sad reality of so many homeless dogs. After several weeks of this, I found myself spending my birthday driving to the SPCA in Barrie, just over an hour out of town. Another four-footed soul had caught my attention online and brought me there that day. On my way in, I passed a room with a window positioned at waist height. As I walked by, a black head bobbed up and down like a kangaroo behind the glass, ears flapping like giant wings with each bounce. I kept walking and met with a few dogs before something drew me back to that bobbing head. When I asked about her all they could tell me was that staff had come in one morning to discover her tied to the shelter fence with a rope. I took her out for walk. She was wild on leash, unfocussed and unresponsive to my attempts at interaction. I can’t say there was any special connection, at least none that was obvious to my logical mind, but something drew me to her. Whether I chose her or she chose me I’ll never know but a week later we were driving home together. My neighbour at the time took one look at her and said she looked like she was made of spare parts. It was true – uncertain genetics had produced a sort of Mr. 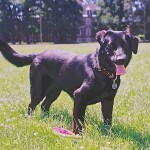 Potato Head of dogs; short legs, a long muscular body, a big Labrador head with floppy ears (one often standing straight up as though giving a perpetual left turn signal). Her long snout was in constant use, including to goose the unsuspecting. Her tail was clearly meant for a dog twice her size but it never stopped wagging and her enormous tongue always seemed to be hanging to the side of a big goofy grin. But her comedic talents extended well beyond her physicality; she was a natural born ham and within days she figured out how to work an audience and had everyone laughing constantly at her antics. I named her Kali, after the Hindu goddess who was all black with a sticky-out tongue. But for all the laughs, there were challenges. If I had thought that a degree in animal behavior and 2 years of studying and working with dogs had prepared me, I was quickly humbled. 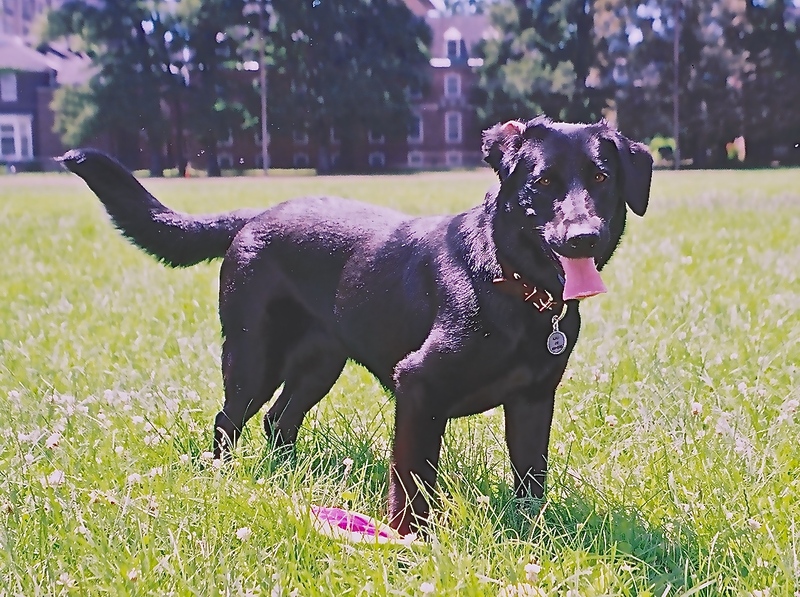 Kali came with a wide spectrum of issues from separation anxiety to aggression, and would launch herself with ferocity at dogs and even grocery buggies or rolling suitcases. Her low centre of gravity gave her the power of a much larger dog and she nearly pulled my arm out of its socket every time we tried to walk on leash. Within a short time, I was getting physio for my shoulder as well as for a pulled tendon in my ankle when I didn’t spot the squirrel before she did and was taken right off my feet. Hardly Heart Dog qualities. I sought the advice of colleagues and without exception they threw their hands in the air with resignation within a short time. We were kicked out of classes. But I persevered, reading everything I could get my hands on and cobbling together my own approaches through trial and error. I took time off work, became an expert on Kong stuffing and spent hours sitting just outside my front door gradually building up the time she could spend alone happily while I stayed within earshot. We started to work on training. Food rewards were too distracting so I became more proficient with a clicker – with few role models to show me the way in those early years we learned together. I home cooked organic meals to address flaky skin and chronic ear infections and fed her by hand. I got up an hour earlier to ensure that we got our 3 hours of exercise in daily. We played constantly. Not that she gave me much choice but I didn’t mind. She was pure fun. It was better than therapy. Her ears healed, her coat gleamed and our bond deepened profoundly. I made a few mistakes but learned through them. There were a few panicked chases through the local backyards when I gave Kali too much freedom before she was ready. I would eventually catch up, out of breath from the combination of running and panic, only to get a goofy-grinned look that clearly said ‘what are you going on about, I’m right here mom! There were a few injuries when I needed to pull her out of scraps with other dogs. She would charge only the biggest dogs in a kind of Kamikaze-esque pre-emptive strike. If she spotted another dog in the car she would launch herself at the windshield in full attack mode. I taught her to like her new seat belt and worked hard those first few years on counter conditioning, becoming an expert at reading even the slightest twitch in her facial muscles to keep us both out of trouble. Molly, my parents’ bossy-but-motherly retriever mix and Shreddie, my peace-keeper ginger tabby, helped guide her in ways that I couldn’t. It took time and patience on both our parts but we learned so much about each other in the process. And our relationship grew deeper. It took a couple of years to work through some of these challenges but we did so with many laughs along the way (OK, and a few tears of frustration). When clients ask for time frames on resolving issues I think about this. If someone had told me it could take 2 years or more I might have been shocked but the time passed quickly and gave us so many more years of pure enjoyment. For those first few years, Kali slept in her crate at night and would put herself to bed at 10 pm nightly, then wait patiently for me to get up in the morning and invite her into bed for a cuddle. She would leap enthusiastically onto the bed and twist her muscle-y, bony body around to face me and my heart would swell. As it turned out, she had also been mastering some desensitization techniques and over time she managed to get me up earlier and earlier for her morning snuggle, until the one night as I was brushing my teeth I turned to see her lying on the bed waiting for me with that big silly grin. And so it was, she had earned it, and so had I. We hit our stride. Her joy for life was infectious. Each day was met with great enthusiasm at the adventures that awaited and I was already loving mornings as much as she did (no small feat). We spent winters playing in the snow and summers at our favourite swimming holes. 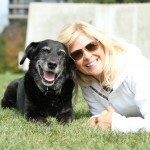 She became so good with other dogs that she came to work with me when I needed to rehabilitate fearful dogs. She adored children and would run up to them and spit balls at their feet as they shrieked with delight. I took no credit for this. We were all just potential playmates to Kali and children just seemed a better bet than most adults. 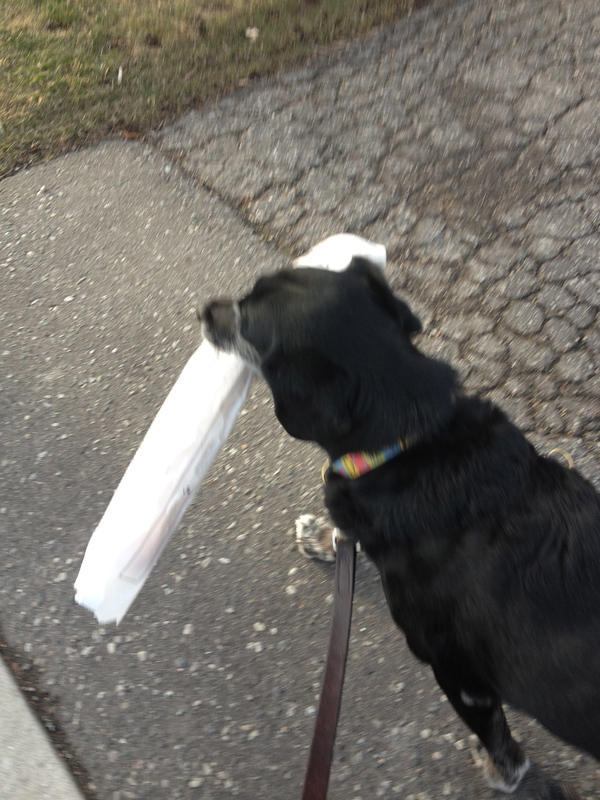 She took her job of carrying the baguette home after Saturday errands very seriously. It seemed impossible to love her any more but somehow, each day, I did. With car-manners much improved, I indulged her determination to ride shotgun and took pride in having her as my sidekick. Passing cars would see the ‘dog is my co-pilot’ bumper sticker and laugh and wave at her goofy grin staring back at them from the passenger seat. I loved how she made everyone smile. Although she developed arthritis early at the age of 7, anti-inflammatories worked miracles and the thought that she was aging remained abstract. 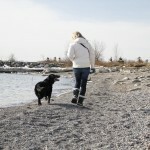 But by age 11, she was noticeably struggling and x-rays revealed advanced arthritis through her spine and legs. Technically she had been a senior for a few years but it wasn’t until then that it became real. By her 13th year the medications stopped working. We didn’t visit the park anymore for our daily hikes. She had a hard time balancing in the car and I took to driving at a snail’s pace so as not to jostle her. I covered my hardwood floors in thick yoga mats to help her move around. Her hearing went. Upon meeting her, a client once asked me how I got her to do what I wanted if she couldn’t hear me. ‘She just knows what to do’ was my reply. At the time I didn’t think much of it but it’s been the basis of my training philosophy since the beginning. Through years of guidance and reinforcing behaviour I wanted, I didn’t have to rely on ‘obedience’. 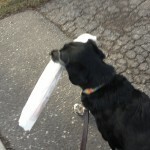 For a while she insisted on doing the 3 long blocks to the corner pet store where they gave her liver treats. I was in awe of her strength of will, and couldn’t deny her the pleasure, even though I had to carry all 60 pounds of her the long walk home. As hard as this was, it was so much harder the day she stopped trying. She no longer slept next to me and admittedly I tried to fight her on it for a few nights before giving in and setting up a cozy bed beside me where I could still stroke her shiny black fur as I fell asleep. I moved my office to the floor so that I could be beside her as I worked. Her appetite waned and I researched new recipes in an effort to get her to eat. I barbecued steaks and chicken breasts and on Sundays, we always shared French toast. Her tail stopped wagging. and just drooped limply behind her. It wasn’t long before I had to carry her out just to pee, often having to prop up her failing hips so that she wouldn’t soil herself. 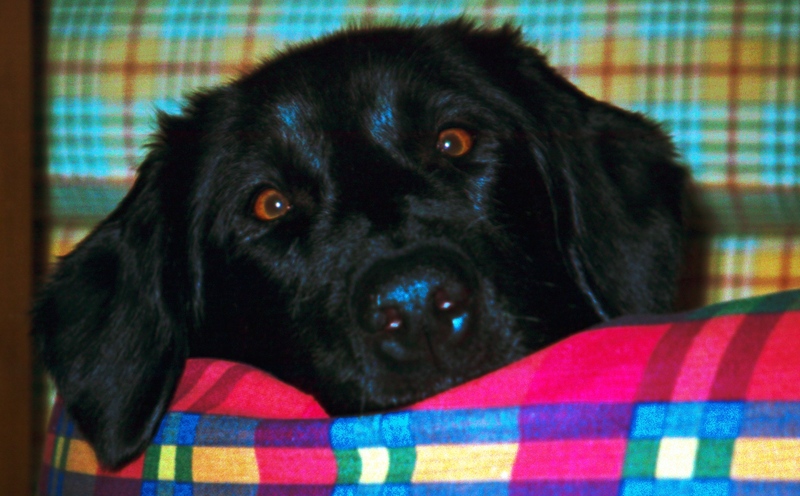 I became a reluctant expert on canine massage and pain medications. At first Kali balked at all of this interference but she quickly learned to accept my help and even learned to ask for it. How I loved her for trusting me so much and finding new ways to communicate with me. The separation anxiety resurfaced and she panicked at being left alone, even for a minute. For the last year of her life, I made sure she never had to be alone. My parents lovingly stepped in to look after her while I worked. I even set up a bed for her in the bathroom so that she could be nearby while I showered. She no longer tried to hide her pain and I stopped trying to deny it. I was terrified each day that we would end up in emergency and was determined to spare her the trauma. After excruciating discussions with the wonderful vet that had cared for her all those years and our angel of a palliative care vet, I made the excruciating decision to let her cross the bridge. It was a beautiful fall weekend. We had barbeques on the deck with the whole family, lots of cuddles and of course, French toast. It’s been almost 6 months since we said goodbye. I am slowly coming back to life but not a day goes by that my eyes don’t well up thinking of her. At what point in this journey she became my Heart Dog, I can’t say. Was it the the instant I saw her bobbing head at the shelter and was drawn back to her or was it through all the work in the early years. Or maybe it was those years we existed together in perfect harmony. Ot the last year of sacrifice and caring for her. I believe it was all of it. When I was a girl my friends dreamed of being princesses and movie stars. I dreamed of becoming Dr Doolittle; of talking to animals and having them understand and more importantly, understanding them. Dear Kali: you made all my dreams come true as well as some I didn’t even know I had. You taught me to be patient in the face of challenges and the meaning of true love. I am a better trainer because of you and a better person. But most of all, you were my best friend. You taught me to embrace each day with enthusiasm and I want you to know that I am trying. Find out when we post new articles. Sign up now!